Tag Archive | "Iris Society"
Dorothy M. Olson 91 of Cedar Springs, passed away Monday, May 8, 2017 at her home. Mrs. Olson was born May 23, 1925 in Sparta, MI the daughter of F.G. and Lena (Dargie) Reyburn. She graduated from Sparta High School and was a former member of First Baptist Church, Cedar Springs. 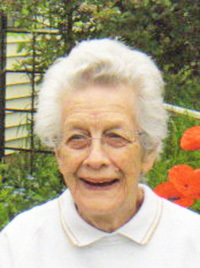 She enjoyed gardening and was a member of the Iris Society. Surviving are her children, Dave (Barb) Olson, Ron Olson, Judy (Al) Ferguson, Sandra Olson, Tom (Denise) Olson, Steve (Deb) Olson, Karen Olson, Joanne Olson, Phil Olson, Paul (Judy) Olson; 18 grandchildren; 23 great grandchildren. She was preceded in death by her husband, Norman in 1988 and two brothers. The family would like to thank Spectrum Health Hospice for their help and care. The family will receive friends Thursday from 6-8 pm at the Bliss-Witters & Pike Funeral Home, Cedar Springs where the service will be held Friday 11:00 am. Pastor Chuck Smith officiating. Interment Greenwood Cemetery, Sparta. Memorial contributions may be made to Spectrum Health Hospice.